Why use LaGrange, OH Property Management company? Why use a LaGrange, OH Property Management professional property manager? Consider the following. You can feel secure as you use our LaGrange professional services which work as a system to protect you while maximizing your return on your property investment. Owner clients have reduced risk with our leasing and tenant guarantees as well as our easy out agreement. Save money and get your house rented fast with our professional videos, pictures and descriptions being exposed on 100s of websites and way more. Realty Trust Services 7 point screening process gives owners the best possible chance of getting a great paying occupant. Rely on our knowledge to most efficiently prepare your house for rent and select an ideal rental rate. Property owners can rest easy, and get an uninterrupted night’s sleep, knowing our 24 x 7 take that midnight call and dispatch help as necessary. Be in the know and head off potential problems before with exhaustive property walk through video reports. We handle all bothersome collection and emotionally draining collections calls so focus on family and business. No stress this year when you prepare your taxes because all of the reports will be neatly delivered with your 1099. You have the option to lease, rent to own and / or sell your home, simultaneously, if you desire. Notes: Please see Lorain County Rural Water Authority, this company is an independent water distributor. Please see Lorain County Rural Water Authority, this company is an independent water distributor. Sewer – LaGrange Sewage and Water Dept. Notes: LaGrange Sewer and Water is through the Lorain County Rural Water Authority. The bill can be put into either landlord or tenant’s name, there is an automatic $100.00 security deposit. This deposit is only used to go toward a final bill, it otherwise is non refundable. You would need to provide a lease agreement. Multiple bills cannot be sent, however, a landlord can request that the company contact them if the bill becomes delinquent or if the utility is to be disconnected. When connecting this service it is best to go into the office, you need proof of purchase or deed, photo id, and if applicable lease agreement. You can also scan or email all of this information if you are unable to go in but personal attendance is preferred. The meter is read every month and the bill is sent out once every month. Trash – LaGrange Sewage and Water Dept. Notes:The landlord can transfer the phone to the tenant, both parties must attend the store to do so. A credit check will be done on the person who the phone is being transferred to and there may or may not be a security deposit. Only the account holder can receive a statement. The only way another person can be allowed to make any changes to the account is if the account holder calls the company or attends an Alltel store and adds another person as an authorized user. They will not accept a Property Management Agreement. The bill is sent out to the account holder every 30 days. LaGrange is a village in Lorain County, Ohio. As of 2012, the estimated population is 2,099. The population density is 1,046.3/ sq mi. It has a total area of 2.01 sq mi and that is all land. 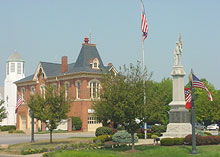 The elevation of LaGrange is 820 ft. LaGrange has only one zip code: 44050. It also has only one area code: 440.